Help Center - Who sees what in “Main group and subgroups”? 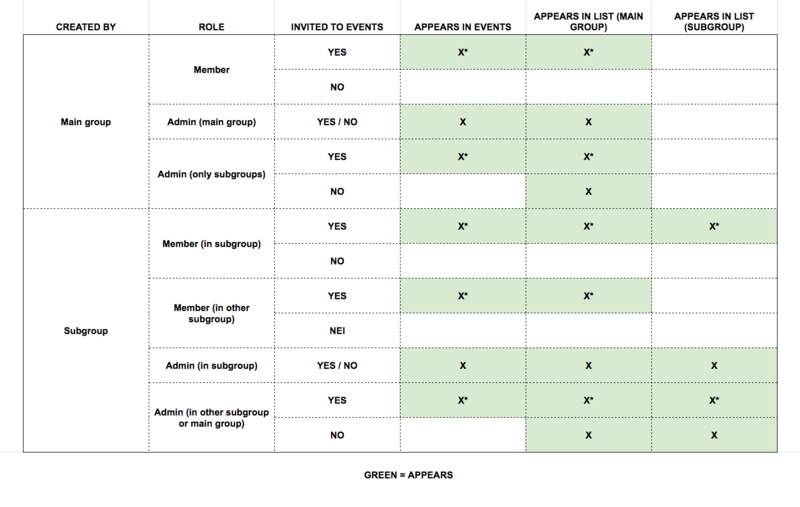 All Categories ​​ Group administration ​​ Groups ​​ Who sees what in “Main group and subgroups”? It is not always easy to distinguish who sees what with one mutual main group and several subgroups. Here is an overview. “In another subgroup” means a user who is not a member in the subgroup where the event was created. When the user is the one that created the event, this will always show in “Events” and in group/subgroup. *If the user has declined the event it will display in “Declined” both in “Events” and in group/subgroups.